BatteryBhai.com™ is India's No. 1 online multi-brand battery store, offering 100% genuine batteries with manufacturer warranty. We have the complete range of automotive as well as inverter batteries and you can buy any car battery and inverter battery from well-known battery brands like Exide, Amaron, SF-Sonic, Luminous, Okaya, MtekPower, DigiPower, Tata Green, Su-Kam, Livguard, Powerzone, AC Delco and Boss. We look forward to creating a distinct brand image by catering to the customers with complete range of Car and Inverter batteries with free home delivery & installation in just few hours. It doesn't matter, which make or model of Car and Inverter you have; we have batteries for almost all of them. 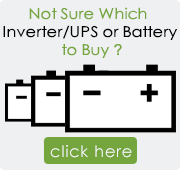 Looking to change the old battery of your Car or Inverter? Buy Car and Inverter battery online at BatteryBhai.com at the best prices and pay online or cash on delivery. At present, we deliver in over 70 cities including Delhi NCR (Covering Delhi, Noida, Greater Noida, Ghaziabad, Gurgaon, Manesar, Faridabad and Ballabgarh), Mumbai, Pune, Goa, Hyderabad, Bangalore, Mysore, Kolkata, Ahmedabad, Surat, Vapi, Chennai, Coimbatore, Erode, Ernakulam, Trivendrum, Jaipur, Bhopal, Indore, Agra, Mathura, Lucknow, Kanpur, Chandigarh, Mohali, Ludhiana, and many more. We are gradually increasing our delivery network to include all major cities and towns in India.